We awoke to a lovely blue sky, today was forecast to be quite hot - and it was. We had planned a fairly relaxed day, though there were a few chores to do. The main one was to strip the bed and wash the bedding, which was a job that fell to me as it's a bit of a job to do by hand. We started the morning with a nice sit in the sunshine followed by a walk down the road to Lidl for some bits and pieces including the ingredients for a stir-fry. 'Henry Horn' was used a couple of times this morning against the yapping hairy rat behind us, whilst we sat outside having a real frying in the sun. The original cunning plan today was to go down to the beach and have our lunch there, but by the time we remembered, we'd left it too late because by that time it was already too hot to go. Lunch instead was a nice crusty baguette filled with fried bacon and a smearing of tomato ketchup. I like international cuisine. At about 14:00 we wandered up to the Petanque pitches, which we had all to ourselves. Not one serious player in sight. The Chef was on form and won both games. Two games was enough for me. During the first game we were joined by a little Spanish girl. She must have been about five years old. We didn't understand a word each other said but she was soon helping us pick up the balls. Her dad came over thinking she was in the way, but again, a few "Ok - No Problem" and he left her to it. I had tried to get a picture of The Chef with the little girl by her side but I seemed to have pressed the button to retract the camera lens rather than the shutter, so no picture. People think this tourist business is a doddle, but I tell you it's hard work. There are a lot of Spanish, including their kids, on the campsite today, obviously here for the weekend. Because most of them rent the chalets, they have no idea about campsite etiquette, and so you get the brat kids running riot through the campsite. I spent a little while sorting through the two large boxes we have in the rear garage for food items, looking for a couple of ice packs, which I eventually found. These will be useful when we start touring should we need to bring food back from a supermarket in the coolbag. I also came across a few slabs of liquorice toffee, one of which I gave to our Irish neighbours. Well, I thought, he's had my wine, so he may as well have my toffee. Late this afternoon I popped across the road to the supermarket and bought a pack of San Miguel beer as we only have three cans of some other brand left and as the shops are shut tomorrow it's best to get some in now in case we need them. When I returned I beheld a wonderful sight. The awning had been removed from the side of the motorhome belonging to the yapping dog behind us and his mummy and daddy. Presumably they were soon to be on their way back to der Farderland - bliss! The Chef created a very nice stir-fry this evening and there was lots of it, as well as a pack of spring rolls. I would have been happy to have sat there for the evening and let it settle but we did say we'd get out and have a walk in to town to take a look at the night life. Well we did, and there really wasn't any. The last time we were down there in the evening the place was buzzing, and all the restaurants were open and very busy, but then I remembered it was when the street carnival was on. Tonight it wasn't, and it was pretty quiet. Either very few people were coming out this evening or they were all going to come out much later on. I managed to get just a few pictures as I couldn't remember how to work the timer on the pocket camera so that I could take pictures in the dark without moving the camera and blurring the picture. Never mind. 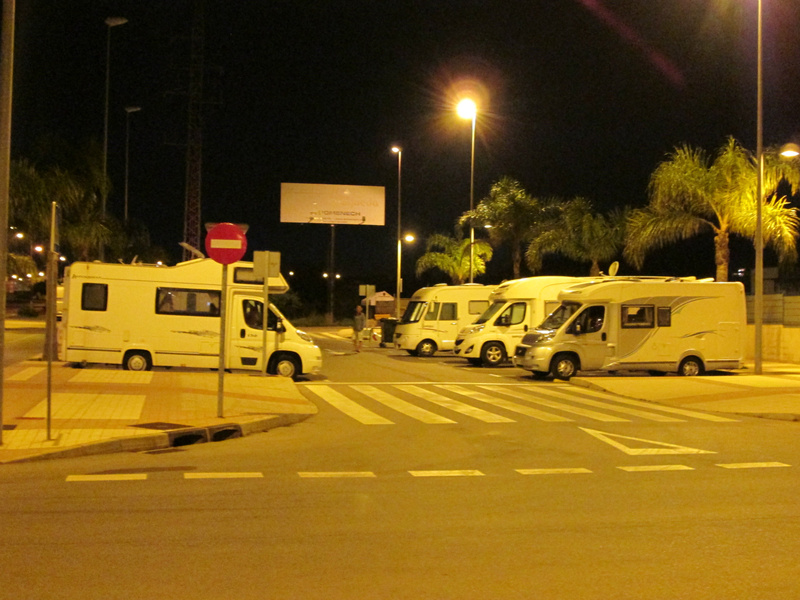 We did check out the motorhome parking area we'd seen when we came back from the railway station a week or two ago. It appears to be a dedicated motorhome parking area in which travellers can stay free for up to twenty-four hours, though at this time of year I bet it gets abused. It's a good location, just off the main street and useful to know if you're just passing through. Last night's DVD entertainment was another episode of 'Only Fools & Horses', and there'll perhaps be another one this evening. As it's the 'Fallas' celebrations tomorrow I think I shall go looking for a horrible Spanish kid to spit roast or stick on top of a very tall pile of old orange boxes, and after that, if I get time, perhaps we'll go down to the beach.